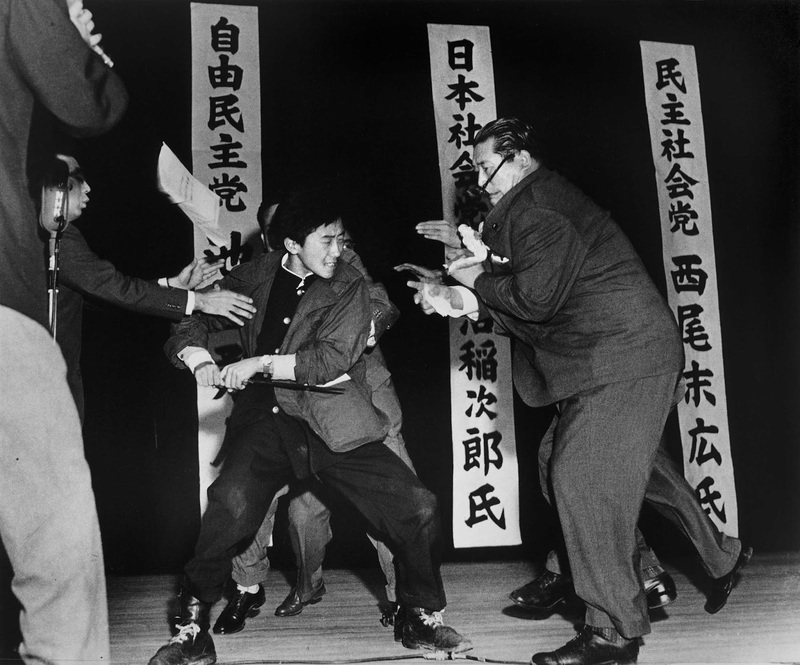 On 12 October 1960, the 17-year-old extreme right-wing student Otoya Yamaguchi kills the socialist politician Inejiro Asanuma with a sword during a speech in Tokyo. The photo was taken directly after Yamaguchi stabbed Asanuma and is seen here attempting a second stab though he is restrained before that happens. Otoya Yamaguchi was member of a right-wing ultranationalist Japanese group. Inejiro Asanuma was leader of the socialist party in Japan. He was unusual in postwar Japan for his forceful advocacy of socialism, and his support of the Chinese Communist Party was particularly controversial. Asanuma was assassinated during a televised political debate for the coming elections for the House of Representatives. While Asanuma spoke from the lectern at Tokyo’s Hibiya Hall, Yamaguchi rushed onstage and ran his yoroidōshi (a traditional samurai sword) through Asanuma’s ribs on the left side, killing him. 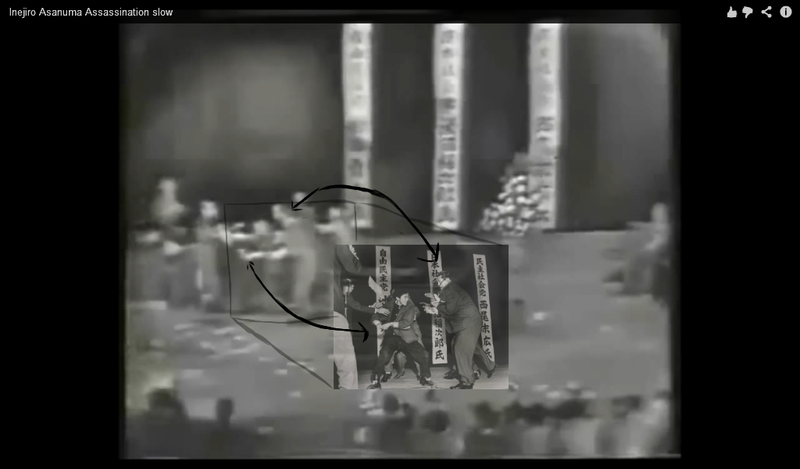 Japanese television company NHK was video recording the debate for later transmission and the tape of Asanuma’s assassination was shown many times to millions of viewers. Footage of the incident was captured live by a Japanese television company. The picture was taken at about 0:27 in the slow-motion video. You can even see the flash of the camera and the pose the assassin strikes in the photograph as everyone rushes toward him. He got pushed or dragged, so even though he enters from the right, in this picture of the second stab attempt he is on the left a few seconds later. Here’s a helpful diagram. The killer, Otoya Yamaguchi, was a member of a group which, among other things, wished to get rid of Western influence and restore Japan’s traditional culture. He chose a weapon that was fitting his purpose, and that meant getting up close and attacking with complete conviction, knowing full well that there was no way he would be getting away. Less than three weeks after the assassination, while being held in a juvenile detention facility, Yamaguchi mixed a small amount of tooth paste with water and wrote on his cell wall: “Seven lives for my country. Long live His Imperial Majesty, the Emperor!”. Yamaguchi then knotted strips of his bedsheet into a makeshift rope and used it to hang himself from a light fixture. The phrase “seven lives for my country” was a reference to the last words of 14th century samurai Kusunoki Masashige. (Photo credit: Yasushi Nagao / 1961 Pulitzer Prize Winner / World Press Photo of the Year 1960). The sword blade used by the killer is called yoroidōshi and it’s one of the traditionally made Japanese swords (nihonto) worn by the samurai class in feudal Japan. The yoroidōshi was made for piercing armour and for stabbing while grappling in close quarters. The weapon ranged in size from 20 cm to 22 cm, but some examples could be under 15 cm. This photo should be renamed as "The day Inejiro Asanuma became a good socialist". A true hero? Killing someone for having an opinion ? So sad, he loved his people and his country more than himself so much he gave his life, he knew he would not escape. Yes a true hero! Some people here are calling this assassin a hero? How disgusting. He was a Japanese ultra-nationalist, and you don't have to look very far past the time of this picture to see what kind of evil those people are capable of. At least in this case he was only able to produce one corpse, as opposed to the millions stacked up by his predecessors. The Emperor to whom he pledged loyalty was none other than Emperor Hirohito, who you might recognize as being the dictator who led Japan into the Second World War. I don't agree much with Mr. Asanuma, but his murderer was no hero.